Latest Logs of 2006 - And A Happy New Year! What a devastating December...DX-wise that is. Finally at the end of the months conditions did improve, and I spent a couple of nights/mornings in Kongsfjord trying to hear some NA. As is usual after a disturbance, EU signal levels were high during the night. The loggings below are those that I heard; since I used five receivers there will be some (hopefully nice ones) that will be found when going through the recordings. Loggings sorted by frequency only; not continent. And of course all the usual dominants from North America, too many to list. With only a few hours remaining this will be my last blog entry for 2006. Best wishes for the new year! WCNS Latrobe PA 1480 email today confirming my October 17 reception. Very rare by all accounts, this Oldies station faded up just long enough to give a "Oldies 1480 WCNS" identification before being lost in WLMV and WHBC. A most welcome catch and verification. WTRX Flint MI 1330 isn't easy to hear but was audible some days in October with their "Sports Extra" moniker. Friendly email from Scott Meier (tnx ABU for email address). WTCM Traverse City MI 580 very friendly email yesterday from Steve Cook at WTCM Production. Heard on October 13. Steve says he's received three reports from our area the past month, so they have been getting out well. KPOW Powell WY 1260 email from April Rodriguez today. KPOW had a good signal level during the KONG14 DX-pedition, but a bit difficult to ID because they ran a lot of non-stop C&W music. Did get a superb top of the hour ID though. Thanks TJB for the email address. WHLY South Bend IN 1580 email from Greg DeRue for a 2003 report. WHLY has since been sold, and has recently flipped to Catholic EWTN programming. Thanks OJS for the email address. Email from owner and GM Lee Leiss today confirmed my reception of KDIX on Oct 11. KDIX is mainly an Oldies station with some of the newer hits and some C&W crossover. Lee says he is semi-retired; he started off as a DJ on KDIX and returned to buy and run the station later on. Nowadays he spends a lot of time driving around the USA on his Honda Goldwing motorcycle. Sounds like the perfect retirement! KORT Grangeville ID 1230 email from GM Melinda Fischer. Heard very briefly on Oct 6 this is an AM/FM simulcast with a C&W format. Also heard from "W" Alan Hall, a C&W artist associated with KORT. KTCR Kennewick WA 1340 was heard on October 12, briefly surfacing through the solid KLKI Anacortes WA signal that day. Station engineer John McDaniel says "...I find this totally amazing since we are only operating at 1 Kilowatt into a 110 foot vertical antenna." I'll agree that 110 foot isn't a lot of height! KQNG Kihei HI 570 has for obvious reasons always been the KONG DX-pedition mascot station! But a massive challenge too - I've heard it very briefly once before (many years ago) but during KONG14 I managed to hear it with fair strength on a clear frequency at top of the hour. Andy Melamed at kongradio confirmed my reception while forwarding my message. My 27th confirmed Hawaiian AM. Only 550 and 790 remain of currently operating HI's, and I hope to find 550 when checking later recordings. If the current CP's in Hawaii get into operation, there should be a fair chance of reaching the 30-station mark within a year. Heard briefly during KONG14, email from PD Kevin Bernard yesterday confirmed my reception. First-time log; CKRU is by far the most usual Ontario station on 980. Ontario verie no 35. Brief email from Mike Collins, GM, confirmed my Oct 9 reception of "News 570". WKBN and WNAX heard at the same time; all three of them now verified. KDLR Devils Lake ND 1240 email from GM and owner Curt Teigen, of Norwegian heritage. KDLR is 81 years old and although Curt has only owned it for a few years, he became interested in its history. The previous owner threw away most of the old stuff including equipment except some items stored in a forgotten place. Read KDLR's history here. There aren't many stations who display their history on the web like KDLR, and that's a shame. I should add that my reception of KDLR was on October 11, and its signal was more like a directional regional-channel station than a non-directional local-channel one. Very impressive. KKGR East Helena MT 680 email from Les Rayburn with a jpg-QSL from the Big Sky Montana DX Test in November. 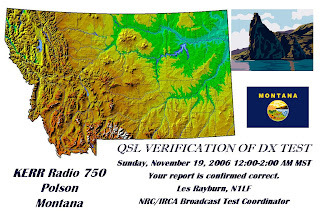 KERR Polson MT 750 email from Les Rayburn with a jpg-QSL from the Big Sky Montana DX Test in November. KERR is my 600th verified North American (counting only ALS, CAN, USA) MW station. A most worthy candidate for such an occasion. Of course I had to brag a bit, which is why you can see the QSL displayed here. A big Thank You to Les Rayburn for his work as DX Test Coordinator! KDIO Ortonville MN 1350 email from their PD expressing interest that KDIO have been heard in other countries the past few months. Heard on October 11. Newstalk ZB, Auckland 1080, Radio Sport, Auckland 1332 and Radio Sport Wellington 1503 all verified by email. 1080 was heard on October 20 (KONG15), 1332 on October 12 (KONG14) and 1503 on October 27 (KONG16). That doubled my New Zealand MW account, and I got my 50th MW QSL from 10 countries in the Pacific. WNYY Ithica NY 1470 heard in October 2006. KFBC has been heard quite frequently since 2005 so they have a decent skywave even if the v/s complained that they aren't heard 20 miles away from the 700 watt transmitter. WNYY was also heard several times during October 2006. Hadn't it been for the Big Sky Montana Test night, I wouldn't have heard WSB. I was on 750 monitoring KERR Polson MT when all of a sudden WSB faded up and ID'ed conveniently. Nice surprise; Georgia isn't easy to hear up here. Email verie from Pete Spriggs today. Verification letter as pdf-file from Josh Roquemore, WSB Radio Engineering today. Cool! KIT was heard during KONG14, Oct 10, while KXMG came up with a good "Magia 1150 AM - Todo Exitos" ID on Oct 31 during KONG16. Should I Send a 1 USD Bill To Canadian Stations For Return Postage? No, I shouldn't! I've been asked to put some focus on this from one of our true friends in the radio business, Richard King at NewCap, Newfoundland. Richard takes care of reception reports to the stations in the VOCM network in NL. He often receives a 1 USD bill enclosed with written reports, however this is not enough to cover return postage! Please beware that an overseas letter from Canada costs almost CAD 1.50, compared to USD 0.84 from the US. At the current exchange rate, 1 USD is 1.15 CAD. Obviously a 1 USD bill doesn't cover the postage. Buy Canadian stamps and use a SASE. (The preferred way) Email Richard! His email address is ckxg at vocm dot com (rephrased here to avoid spambots – do NOT publicize the exact email address). Emailed reports with small audio files is the easiest and fastest way for Richard to maintain his excellent service to DX-ers.